Director Duncan Jones (Bowie’s progeny and the wunderkind behind MOON, his film debut) proves that the disturbing resonance and edge-of-seat storytelling finesse he brought to that old-fashioned new tale was not a fluke. SOURCE CODE is yet another exploration of an isolated man trying to interpret his destiny, while forces around him conspire to end it. Stevens wakes in some kind of chamber that is slowly deteriorating. First thing he sees is an angel… Vera Farmiga as Goodwin, on a monitor in front of him. (Sigh, the glorious Vera Farmiga; it occurs to me I know what person’s body *I’d* like to wake up in… Those eyes, those lips, that uniform! I could stare at her for hours without saying a word. I think they call that True Love. Are you listening, Vera?!) Ahem, onward…. Plot is revealed to the audience – and Stevens – piecemeal, as he is transported back time and again into Fentress’s body to locate the bomb and bomber; we live through his eyes and befuddlement. In the real world, the bomb destroyed the Chicago-bound train, killing scores, and the bomber has promised another bomb in the city. In this alternate reality, military pilot Stevens (whose last memories were flying a chopper in Afghanistan) is here trying to subvert that future. But where is here?A shadowy, twitchy supervisor, Rutledge (Jeffrey Wright), makes clear to Stevens (and to us Michael J. Fox fans): “This is not time travel. This is time re-assignment.” Working on the age-old concept of the human brain remaining alive a few minutes after death, a device called the Source Code uses those last imprints of reality to engineer an alternate reality. According to Rutledge, “a program that enables you to cross over into another man’s identity in the last eight minutes of his life.” Highly implausible, but the bullet train pacing keeps us from asking one question too many. Such as: What could possibly be the utility of transporting into another person’s body for the last eight minutes of their life? I mean, transporting into the last eight minutes of most people’s lives would land you in a sickbed somewhere with a machine that goes ping. For eight whole paingod minutes. Oh joy. Listen for a phone-in cameo by Scott Bakula (well-versed in QUANTUM LEAPs) as Stevens’s father. Why are some critics lambasting SOURCE CODE for being unoriginal (it’s a TV plot we’ve seen before on QUANTUM LEAP, THE OUTER LIMITS, STAR TREK, et al), while Jennifer Aniston is still being allowed by the Motion Picture Association of America to release the same dull thud girl-meets-boy movie year after year? Written by Ben Ripley with no thought to any actual science or physics, the “Source Code” of SOURCE CODE is actually a McGuffin–we don’t need it explained to acknowledge the movie as a temple-throbbing, upside-down rocket ride; it’s running down a panther in boot-cut jeans; it’s cutiepie and sexyboy in a kinetic race against ticking clocks piled on bigger ticking clocks. That’s how inexplicable this movie is. And yet, so predictable you can set your DeLorean flux capacitor by it. 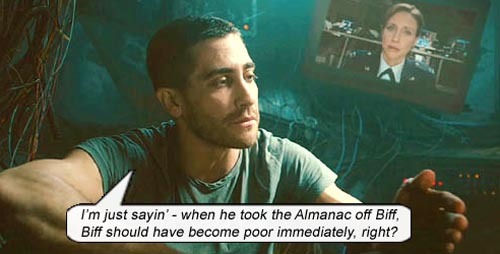 But, like MOON, in the hands of Duncan Jones, SOURCE CODE becomes another true science fiction thriller, where we don’t care too much about age-old devices of corporate bad guys and slim, virginal love interests because we’re enjoying ourselves too much. Starring: Jake Gyllenhaal, Michelle Monaghan, Vera Farmiga, Jeffrey Wright, Michael Arden, Cas Anvar, Russell Peters, Brent Skagford, Craig Thomas, Gordon Masten. Human Frailty and the Quest for Blame. SOURCE CODE joins a salvo of modern films that questions society’s grasp on reality and free will; films like EAGLE EYE, SHUTTER ISLAND, INCEPTION, THE ADJUSTMENT BUREAU, are all busy shattering our human forthrightness with Freudian displacement gestures. This new rash of films doesn’t deal with simple “time-travel” as the damper of free will (like BACK TO THE FUTURE, A SOUND OF THUNDER, 12 MONKEYS) but expands on “technology-time-anomalies” that make them seem like the best excuses yet to shunt blame onto, because only Stephen Hawking can explain them. They try to disguise Vera Farmiga’s handsome femininity behind that uniform that doesn’t quite succeed in hiding her smokin’ figure (irony is: a uniform’s purpose is to homogenize, but on voluptuous women, it serves to emphasize! ).